For many homeowners, spiders are the scariest residential pest. Spiders are not insects. In fact, they are in the same class (Arachnida) as scorpions and ticks. But the size and behavior of many spiders makes the sight of them in your home much more alarming (terrifying for some) than traditional common insects. No need to fear, however, as there are some basic prevention tips that can help keep spiders away. Insects and other pests attract spiders to live in and near homes. Spiders are a bit more difficult to control than most pests because they do not clean themselves and thereby ingest the products that are designed to control them. Unless a spider is directly hit with professional products, it will typically not die directly from a pest control treatment. By effectively controlling insect populations, spider activity diminishes within a few weeks as spiders starve or move on in search of food. General Info: A common spider found in North America and many parts of the world. Their excellent eyesight enables them to effectively hunt prey. Most wolf spiders are wanderers that either hunt food over short distances or wait in temporary burrows for prey to pass by. Bites may be painful and itchy, but are not considered dangerous. 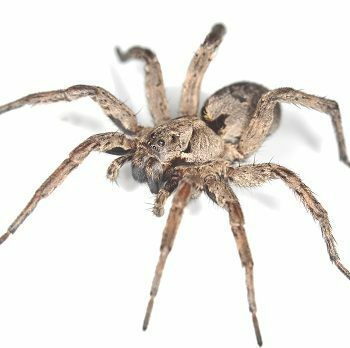 Residential Location: Wolf spiders can be found under and around stones, landscape timbers, firewood, decks, leaf litter, and other locations. They typically do not climb above ground level. Random/Interesting Fact: Females carry egg sacs on their spinnerets. Baby spiders ride on the mother’s back until they are ready to fend for themselves. Identification: They are typically dark brown with variations that help them camouflage into the local habitat. 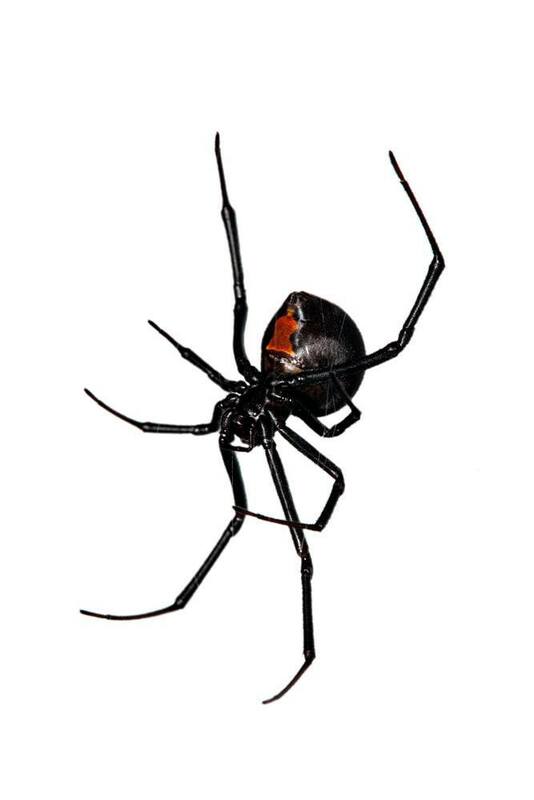 General Info: Black Widows are the most recognized spiders in North America. They are famous for the red hour-glass, dangerous bites, and sexual cannibalism. Region Found: Each state except Alaska has one or more of the Southern Black Widow, Western Black Widow, or Brown Widow. Residential Location: They are commonly found around the perimeter of homes, below waist-level. Black Widows are not known to live indoors under normal circumstances. Carefully check under the bottom lip of siding around the home, under downspout trays, and other objects around a home. Random/Interesting Fact: Approximately 1 in 8 times that a black widow bites a human it injects no venom. Identification: Black Widows are glossy black spiders with large abdomens. They can have a red hourglass, a red line, or even red dots on the bottom or top of the abdomen. If you see any red markings on a black or brown spider, stay away. It could be a Black Widow or Brown Widow (a close and highly venomous cousin). Webs of Black Widow spiders are “chaotic”. They have no pattern. Black Widow silk is incredibly strong. If you are wiping down a spider web and you feel resistance and hear the silk strands tearing, you may have a black widow web. Early Symptoms of Black Widow Bite: Pain, redness, swelling, cramping in the stomach and/or chest. 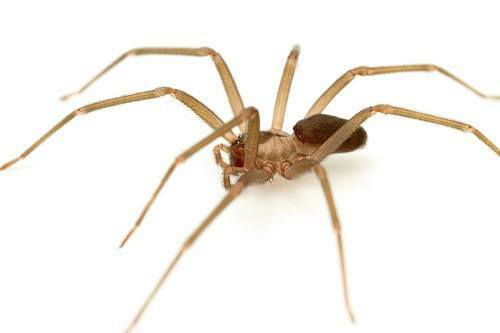 General Info: Brown Recluse spiders are famous for their dangerous venom that rots skin (necrosis). They like to inhabit dry, undisturbed areas for long periods of time. Fortunately, they are reclusive and rarely bite humans. Most bites occur when someone puts on a glove, shoe, or piece of clothing the spider was living in. Region Found: South-Central states from Texas up to Nebraska, East to Kentucky, and South to Georgia. Residential Location: Sheds, wood piles, closets, chest-of-drawers. Random/Interesting Fact: These spiders often infest cedar shake roofs and spin irregular webs, which are used as a retreat. Identification: Brown Recluse spiders have a marking that resembles a violin or fiddle, hence the name “fiddleback spiders”. What To Do If Bitten: Periodically apply ice to the bite and seek medical attention if symptoms worsen. If someone can safely catch the spider, this will help medical professionals confirm the appropriate anti-venom. Symptoms of Brown Recluse Bite: Many people do not report feeling the initial bite, but it is followed by minor pain and itchiness, potentially accompanied by fever and chills. If an open sore develops 5-8 days later, you should absolutely seek medical help if you haven’t already. The open sores frequently last several months and may require surgery if medical help is not sought early-on after the bite.